While just an adolescent in fourth grade, Cole Medeiros enjoyed doodling. Now, as an adult, Medeiros has turned his childhood interests into a profitable, and exciting, business—GUBS. 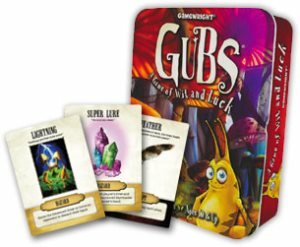 Gubs is a card game of “wit and luck” based off a unique set of 15 creatures that ride on the backs of Velvet Moths or Toads, hide from danger inside hollow tree stumps and forest underbrush, and search for valuable Lure treasures. 1. What made you decide to further develop your fourth-grade doodles into an actual card game? To be honest, it was less of a conscious decision than you might think. I loved playing games. I played them on NES and Super NES, and spent what little money I had buying card games like Magic: The Gathering. The neat thing about making games is that the development is very cheap and anyone can do it; one night I just cut up some index cards and made a deck of gub cards. We played the game over and over, and each time the feedback improved the game. Over a few years, it organically got better and better. 2.Who were the first people to play Gubs? What was their initial reaction? The first person to play had to have been my brother Alex. He was (and still is) my first and best critic for all my projects, and I consider him a co-creator of Gubs. And, unfortunately, I don’t clearly remember our very first game, but it must have been good enough to play it again! Many, many people were very supportive (especially my parents! ), but I’d like to call out Matt Griffin (a fellow game designer, who, over the years, I’ve worked with on many of my personal projects.) 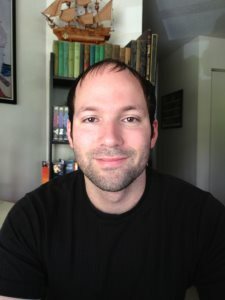 He has been very successful with launching his own game, a PC game called Wanderlust, and a constant collaborator. Also I should mention one more designer named Grant Rodiek, who published his card game Farmageddon using Kickstarter. Though he was not involved in the development of Gubs, he and I constantly ‘playtest’ and comment on our new game projects. I admire his skills, which are very business and publicity-oriented. The world of game design is very small and very collaborative; it’s great to know good, talented people to help bring new ideas to the surface. 3. What/who is your favorite character? Why? My favorite characters in GUBS have to be the Toad Riders. They are the knights of the gubs, valiant, brave little warriors. One of the things I enjoy most about gubs is the juxtiposition of serious and comical elements, e.g. in the toad rider we have a proud little warrior, but he rides on an awkward tiny toad complete with a saddle. 4. How much does the game cost and where can people buy it? The game sells for $11.99. You can order it online through my website or many other places online, including Amazon, eBay and more. Smaller retailers across the country sometimes carry it, and it can still be found in the travel section at Barne’s Nobles. 5. What challenges did you face on the road to officially producing this card game? The full story is outlined here, but the challenges were many. Back when I started trying to publish this, I had to create the prototypes myself. I hired an artist and nearly handcrafted the first few decks, which I sent out to companies. After a few rejection letters, I published it myself, which was how Gamewright found the game. We were selling lots of decks (literally shipped from my parents’ garage) and orders kept coming in until we sold out. The hardest part for me is self-promotion. It takes a great deal of time and energy. And while I loved meeting fans and doing the leg-work, it’s hard when you work a full-time job in addition to getting your game out there. I’m glad Gamewright picked it up to give it more exposure, and they have treated it with a lot of love. 6. Is there anything you would have done differently in your pursuit of creating Gubs? Nothing comes to mind. I just kept trying and trying, and each dead-end or failure taught me a lot. I think that’s the biggest lesson: If you want to do something, just keeping working at it. Be patient with yourself. Take time and put a lot of love into it. Don’t look for the easy way, but be prepared to do lots of hard work. Celebrate your successes along the way, and just take the project one step at a time. Eventually you’ll either succeed or the project will morph into something awesome you never expected. 7. What’s next in store for the card game? Recently the game was turned into an app for iOS that has been doing very well, with more than 10,000 downloads and tons of good reviews. It has really helped expose people to the game. Also I’ve been developing lots of Gub related projects, like a Gubs board game—an expansion to the card game—and even a story book. They are still very much under development, but I’m really excited to share them once they’re ready. 8. What advice would you give to those who have a creative idea but are hesitant to pursue it? I feel like anything worth doing takes time, so be patient (with both the project and yourself). Any step forward is progress. Work on it a little bit whenever you can. Enjoy it. If you love working on something, it will show. Be realistic about the market you are planning to deliver your project into, but worry about it later, after you’ve gotten most of the heavy lifting done. For example, if you build the website for your game before you build the game, it can have negative effects on your creative freedom. Also, think of your project as a series of rough drafts. It’s so easy to look at finished products in the marketplace and think “How can I ever make something so great?” But the truth is, those great things went through thousands of refinements. I sometimes like to read first drafts of some of my favorite books; it shows you how terrible they were originally, and you can see how much work went into them to make them great. Don’t be discouraged and throw a failed draft into the trash. Figure out what worked and what didn’t. Analyze why. Try again, keeping the good and removing the bad. They say fail fast and fail often because you learn very quickly what works. Don’t spend too much time making a prototype look pretty, because it will waste time and get you too attached to parts of it you may need to kill. I think of it like this: The first few drafts are just me digging up clay, while all the drafts afterwards are me shaping the clay. I work in social and mobile games. I was once a graphic designer working in marketing. I was a senior game designer at Zynga, and now work on mobile titles for Storm8. While I get to do some pretty awesome stuff at work, I think it is very important to continue to have my own projects outside of work. It sharpens my creativity and hones my abilities. It lets me experiment far more freely than I can in the professional world. I strongly encourage people to work on projects of their own outside of work. Try to treat it like play. Recreation is just that—re-creation. You are recharging a childlike energy which can make you stand out from the crowd, and be better at any career you pursue. Embrace the things you love to work on, and I promise you will be surprised at your own capabilities. Have fun!